Keep this Linux command cheat sheet on your desk printed, I am sure you will learn them quickly and will be a Linux expert very soon. We have added had both pdf and image (png) format of the cheat sheet. Command are categorized into different sections according to its usage. 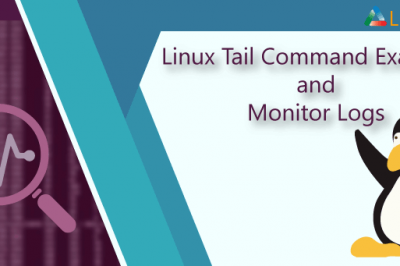 We have designed the command in white color with black background as we often use on Linux shell. We have added bit color for attraction. 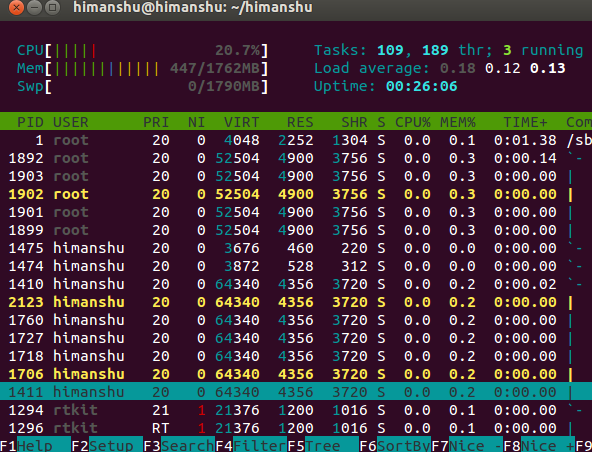 We have grouped Linux commands in the below sections for better understanding. 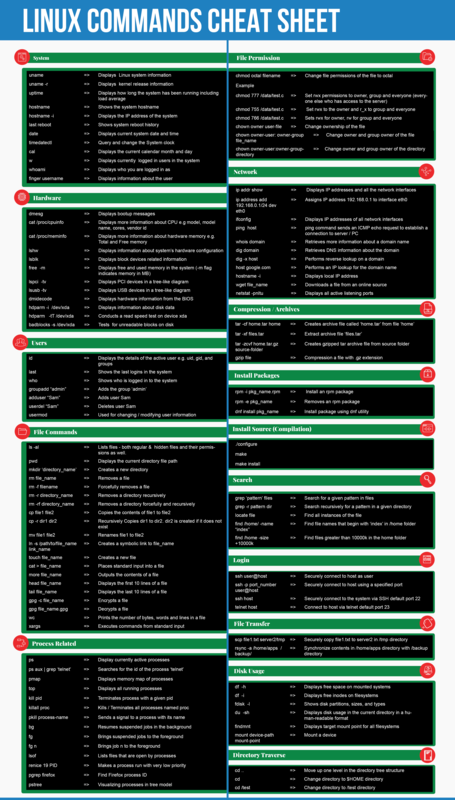 Download your linux commands cheat sheet in pdf format which is updated in 2019. Please keep us posted if you have any suggestions or if you find any command that we missed out. If you are looking to print Linux commands cheat sheet in A4 size paper its available for download. ls -al Lists files - both regular & hidden files and their permissions as well. Wow, very good idea, this cheat-sheet is very nice to have under the keyboard. Seeing forward for more commands on this sheet. Philip, sure will add more commands as it goes. Handy chart, but why this order? Why not by frequency of use, order of likely need, or alphabetical? I really like the layout of this Paul. 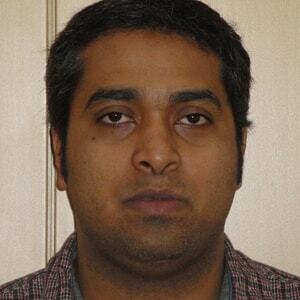 I am just learning linux and trying to learn some commands. If I wanted to put a link in a file directory or delete a directory then trying to find it alphabetically would be hard since I don't know the command I am looking for. Also the poster is right. Which commands someone uses most often depends upon what they usually work with. 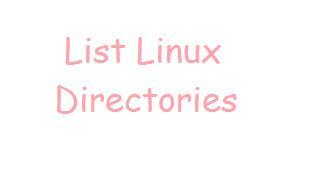 If I know I want to change a directory or file I can just look into the appropriate category. How about moving sections like system and hardware far away from the top and sticking to commonly used but harder to remember sections like process, install from package etc near the top. "bg" does not "Lists stopped or background jobs"; it puts the most recent job in the background (ctrl-z then bg). It's "jobs" that lists 'em (which I always have aliased to just "j"). Awesome stuff, thank you. Would you consider doing it as a 16:9 Wallpaper? Small typo after uname -r. Says "isplay kernel information" instead of "Display.."
Why each command begins with '#'? It makes the whole very useful thing less readable! Thank you! Great cheat sheet! Maybe a write-background for printing would be an idea? I came back to see if you'd fixed the error I pointed out on your cheat sheet, but instead I see that not only was it not fixed, but my comment pointing it was DELETED. Why? I'm not wrong. To be clear - The ERROR above is that "bg" does NOT "list stopped or background jobs"; the "jobs" command does that. "bg" puts the most recent job in the background. Hi Jason, You are 100% correct. I am really thankful for pointing out this. I really saw your comments other day. Please give me couple days , I will change it on infograph. I have already changed on the html page(detailed command page). The only MAJOR problem I have with this so far is that the page clearly states at the top that this page is 'supposed' to be for the Black & White version of the Cheatsheet, however the .pdf file linked to is for the Color version. And the cheatsheet image itself is the color version as well. So where do we actually get the Black & White version from? 2) Could you provide us with source files so anyone can make translated versions of the infographic and submi it back here? Hi Bobbin great thanks.. this sheet is very useful for me to learn hdfs file operations in hadoop. Please INVERT colors before printing! It would be really really helpful to have a true black & white version. The color version is very nice, but not all printers handle pdf color inversion correctly. Excellent work collecting this useful cheat-sheet.